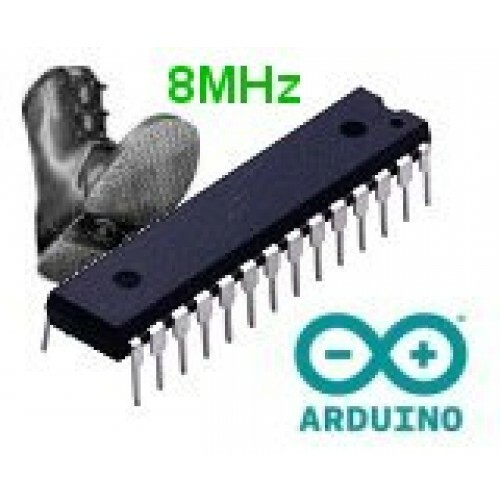 ATmega328 with Arduino 8MHz Bootloader - the name says it all on this one. An ATmega328 in DIP package, pre-loaded with the Arduino (8MHz) Bootloader. This will allow you to use Arduino code in your custom embedded project without having to use an actual Arduino board. To get this chip working with Arduino IDE, you will need an external 8MHz crystal or resonator, a 1.8 to 5V supply, and a serial connection. You should select the Arduino Pro or Pro Mini (3.3V, 8 MHz) w/ ATmega328 board within the Arduino IDE. If you are not comfortable doing this, we recommend purchasing the Arduino Uno board that has all of these built into the board. According to the Atmel datasheet, the safe working voltage at 8MHz is between 2.4V to 5.5V. These chips are thus suitable for running from 2x 1.5V batteries, which is useful when interfacing with 3.3V devices as no voltage level conversion is required.